Jamestown Native’s 30 Years In Dodger Blue | The Jamestown Comet. The Los Angeles Dodgers’ Fred Claire left Jamestown, Ohio as a young man, but remembers his roots in his memoire. LOS ANGELES – If there was ever any doubt as to whether or not small town life can affect a person long after they had grown up and moved away, the inspiring story of one Jamestown native might eliminate it once and for all. Fred Claire is a testament to those values put to trial in the wilderness of big city life as he rose from being a sports writer to an executive for the Los Angeles Dodgers in sunny California. A shop keeper’s son starting out at the tail-end of the Great Depression, Fred Claire was born on October 5, 1935 in Jamestown, Ohio. His mother, Mary Frances Harper, was born and raised in Jamestown where her father operated Harper’s Drug Store. Ironically, given the town’s modern history, his grandfather’s store was eventually destroyed by fire. Claire’s father, Marston, later opened another drug store on the opposite corner of the village. “My Dad’s drug store was simply known as Claire’s Corner Drug Store,” Claire said. As a young boy, he lived in the apartment above the store with his parents, his brother Doug and one sister named Lynn. With his family, Claire enjoyed fishing trips to Canada and nearby Indian Lake and began his business career as a young entrepreneur. “My brother and I trapped muskrats,” Claire recalled. “And I had a newspaper route delivering the Xenia Daily Gazette.” As it turned out, newspapers would be an important part of his life over the years. Claire suggested that his passion for sports came from early summer mornings in Jamestown when friends would throw pebbles at his second-floor apartment window. This was, according to Claire, “the indication that it was time to get up, get the baseball equipment and head out to the diamond at Silvercreek School.” He was referring to the historic school at the corner of SR 72 and South Charleston road in Jamestown which currently serves as the Greeneview primary building. In 1950 Martson and Mary moved their family to Torrance, California, a suburb of Los Angeles. Claire graduated from Torrance High School, and then went on to attend numerous colleges before obtaining his bachelor’s degree in journalism. Throughout the late 1950s and 1960’s, Claire worked for a number of local newspapers in and around the Los Angeles area, mostly as a sports editor. In 1969, he went to work for the Los Angeles Dodgers climbing the ladder from publicity director all the way up to executive vice president and general manager in charge of player personnel. Many people growing up in a rural community have hopes and dreams of making it big and leaving small town life behind forever. Claire, however, took his hometown along for the ride, if only in his heart. The baseball was given to Claire by Dodgers player Rick Dempsey moments after the team had clinched the 1988 World Series against the A’s. He was one of three who received the World Series trophy along with Tommy Lasorda and team owner Peter O’Malley and he never forgot what it took to get there. “It was the result of an amazing amount of work by an organization that bounded back after finishing 16 games under .500 in each of the two previous seasons,” Claire noted. 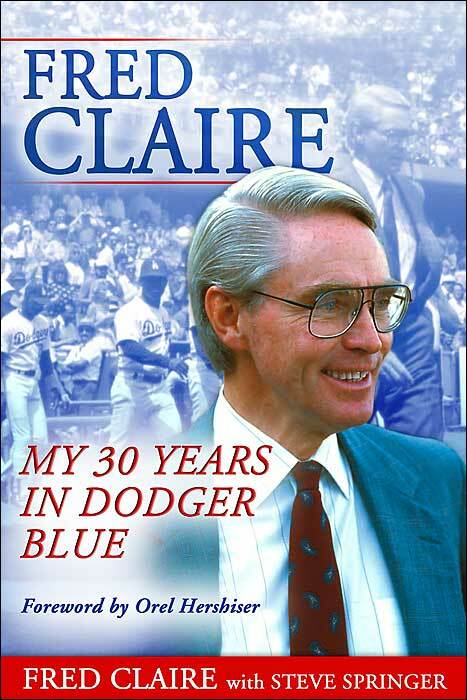 In March of 2004, Sports Publishing, LLC published (START ITALICS) Fred Claire: My 30 Years in Dodger Blue (END ITALICS) (ISBN 1-58261-732-5), a book about Claire’s long and distinguished career. He co-authored the book with Steve Springer of the Los Angeles Times and discusses his life in the business of baseball beginning with his life as a boy in rural Greene County, Ohio. The book has been recognized on the Los Angeles Times’ Bestsellers list. Of course Claire’s work is in no way finished. In addition to writing about his career, he also works to help a new generation achieve their goals in sports and business. Fred Claire has three grown children of his own, daughters Jennifer and Kim and son Jeff. Today, he lives in Pasadena, California with his wife Sheryl and keeps tabs on his home town, staying in contact with a few old friends from his boyhood community. In February of 2009, I received an email from Fred Claire. He had found my work online and wrote to connect with a fellow writer from his hometown. After a few correspondences, Mr. Claire sent me a copy of his autobiography. On the inside cover he wrote, “To Gery – Thanks for keeping Jamestown in the news.” My thanks to Mr. Claire and we hope he comes back home for a visit sometime soon.